Priyanka Chopra’s latest biopic Mary Kom based on the life of champion Indian boxer Mary Kom off to a good start at Box Office. As per the latest reports coming up the movie has got a decent opening of around 30 to 35% all over the country. This can be considered as a good start for a woman centric drama. Good news for Mary Kom is that it has already been declared tax-free in Maharashtra, UP, Rajasthan, MP and Assam. The movie has created a lot of hype and buzz for the last few months which will certainly boost its chances at Box Office. Blog to Bollywood has earlier predicted that Mary Kom will get a decent start at Box Office with opening day collection would be somewhere around 7 to 9 crores. With 30-35% start in the morning shows we can expect the movie to pick up in evening and night shows. A good jump in collection is expected over a weekend. Mary Kom is released on around 3000 screens today. Since, the movie is not a commercial pot boiler we can’t expect high occupancy on single screens. The movie will surely gets urban and multiplex audiences. Well, my expectations are not huge from the movie considering it’s not a commercial pot boiler. It would be interesting to see if Mary Kom could beat other women centric movies like Queen, English Vinglish etc. 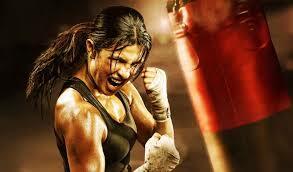 Did you get the chance to watch Mary Kom. Share your thoughts with us.